The new rare ore in Mists of Pandaria is called Trillium Ore. It’s the equivalent to Wrath’s Titanium and Cataclysm’s Pyrite Ore. You’ll find two flavors of Trillium from Trillium Veins around Pandaria: White and Black Trillium. Trillium is an extremely valuable ore since it’s the highest quality and most rare ore in Pandaria. It will go for 100-300 gold on most realms, per ore! Due to the low volume of ore that actually sells and the fact that most players only want a few, you can sell these in stacks of one. Update: You can make a lot of gold with Trillium, but if you want to step it up and make thousands of gold you should read my personal favorite guide. The best place to farm Trillium is in Dread Wastes. It is the highest level zone and has the most spawning nodes that could possibly spawn as Trillium. Use the following route to gather the most trillium. The next best place to farm Trillium is in Townlong Steppes. The dotted line around Niuzao Temple is optional. I recommend circling Townlong Steppes twice and then moving down to Dread Wastes, return to Townlong after two passes around Dread Wastes. Ran Dread Wastes as per your instruction for several hours. Never saw a single spawn of Trillium. Your guide is incorrect. Right… because it didn’t work means it is incorrect. I have done a few of my own mapped out runs for Trillium, and my path was similar to yours in the Dread Waste location, and as with another commenter, not one node appeared. I have yet to find a reliable spot for this stuff to spawn. So far the only place where I have seen nodes respawning is the Tu Shen Burial Ground in the Vale. I was able to gather from 4 nodes there in about a 15 minute time period. I ran it for a while and found one Trillum node. The entire point of a guide like this is to give people a functioning method. If your method does not work, then yes, it is incorrect. There is no “functioning” method for finding a RARE spawn of another ore.
i agree, this is totally wrong, my farm points gives me like 4 trillium every half hour, did this for an hour and not 1 trillium. You also have to consider that trillium may act as the herbs did back in Cataclysm where if you were to mine one of the herbs it increased the chance of another rarer herb to spawn. So maybe if you follow this route and grab all the Ghost-Iron it may allow more Trillium to spawn. You cannot look for just trillium you will never get any. your guide was fine, I found tons of trillium using your path. Mate there is quite a bit! I got 10 bars in 2 hours, I believe the trillium is a rare spawn of ghost iron. Searched in dreadwaste on your guide, found about 10 4 times around, not too bad, but another reliable source is to kill the obsidian sky serpent by the summit in Kun lai it is an off chance but you can get up to, I believe, 16 of either White or Black Trillium. I agree, this method DOES work, unfortunately trillium is pretty much as rare as the other rare spawn ores in all the other xpacks, basically you can just your regular mining route in either of these 2 zones, and everytime you mine a ghost iron/rich ghost iron trillium will have a chance to spawn in its place. You guys do know that it doesn’t spawn quickly, and you’re not the only miner on the server. i have had loads of luck with lakes/streams in Vale of Eternal blossoms. also to people that complain. high populatet servers, is harder to work this way. since so many farm or is out always. I ran this route twice and got multiple trillium nodes with a few rich trillium. seems to work for me. Found this pretty good, I even found a Rich Trillium Vein along the way – Got 10 Black Ores out of that 🙂 Thanks! I’m guessing the people who think this guide is incorrect based on the fact that they didn’t get much trillium, probably play weekends on a high volume server. I had the same problem farming Titanium, you’re gonna get the best results when no one else is playing. also, since trillium is a rare spawn of Ghost Iron, you need to mine the ghost iron too, so that you reset the node. Same as Titanium in Icecrown, you basically farmed Saronite to vendor (or ah depending on your server) and grabbed Titanium when it popped. You also have to consider that trillium may act as the herbs did back in Cataclysm where if you were to mine one of the herbs it increased the chance of another rarer herb to spawn. So maybe if you follow this route and grab all the Ghost-Iron it may allow more Trillium to spawn. You cannot look for just trillium you will never get any. Good Luck All! My thought right now is like “WTF DUDE! !” dont share your pretended knowledge with a guide when you apparently dont have any ! I got full bags (about 2000+) of regular ore (whatever you call it in english), 77 kyparites, and 30 trillium ore (ridiculous)… oh and wait they all are black tril, i cant make a single bar ! Dude if i were you i would burry my head in a place where i cant see light … going back to my former spot where i can get around 5 bars an hour without having to fly over an horrible zone for hours ! For the others who are really looking for trillz and want a plan, they do spawn randomlu so chopse a SHORT path with more nodes as possible (yes, caves are awesome!) and do it “brainlessly” until trillz spawn, i seem to notice the more you farm the dame spot, the more it spawn … nuff said. There is no right or wrong. It’s a rare spawn node. If you don’t mine the ghost iron they won’t pop. This is simply routes that have been successful for the people that wrote this. Just because you had a great day and got 10 hits in an hour doesn’t mean you have a great route. Means you got lucky. And that luck ran dry and you googled trillium farming and came here. The ONLY reliable spot for Trillium is the Auction House. Everyone who is saying these guides are incorrect need to find a new game to play. First off, Rare node means it will NOT always be spawned AND means that YOU are not the ONLY one looking for it. Take into consideration your server population. Even if it is low, there is bound to be at least one other person farming it other than you. Expect to be disappointed when farming. Otherwise you will end up rage quitting, which would actually be better for the rest of us players. 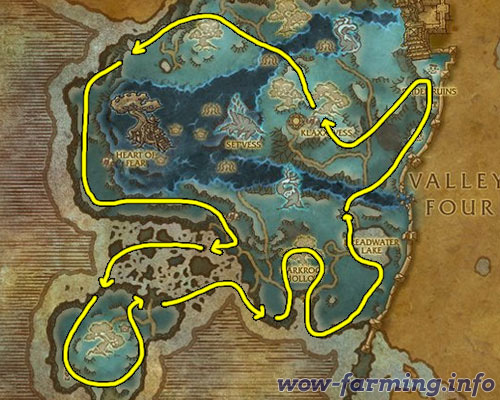 This is a public knowledge, farming route for resource for lvl90 miners. If you aren’t getting any nodes, it’s probably because you aren’t the only farming it at that time. Just because one person can’t mine a single node does not mean someone else cannot. Anyways, I got about 2 stacks of white and black in an hour one day and barely any trillium let alone the colors a few days afterwards. I do the middle and streams in vale of eternal blossoms, i get more there than i tried in dread wastes. In dread wastes, all i found was kyparite and ghost iron, I’m sure theres some trillium there, but i didn’t see any. I do in vale though. Best way to farm trillium is with potions of luck / mass trash farming at Windward Isle / Krasarang. I pull about a stack of bars every 1.5 hrs (40 black / 40 white raw ore). Nomanis and Coznec run twitch streams you can watch to see examples of farming there. Good luck. I took 1 1/2 circles around Dread Wastes. Out of 18 stacks of ghost iron mined I located about 8 nodes containing 12 white trill, 15 black trill. 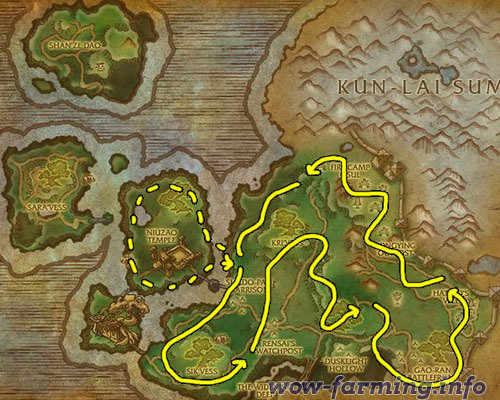 I have used plenty of these guides and they are great, i have ran this loop didnt find all that much but i have a feeling there were alot of ppl online farming it keep that in mind b4 bagging this guide out they didnt have to go to the trouble of making them for us and its not like we pay for it so shush..